Quality Assurance & Control | Pearson Coal Petrography - We fingerprint your coals, coke and carbons. Our four laboratories are geographically dispersed, which has given us a unique challenge – maintaining global standards to ensure each lab can generate the same values on the same sample. To do this required a particular attention to all aspects of not only the ISO standards, but to reach beyond them – and include the recalibration of photometer systems. The control circuit boards of the younger generation of Leitz MPV photometers (since 1982), contain several digital potentiometers – tuneable 100-ohm resistors that should be trimmed periodically to ensure the linearity and accuracy of the systems. Of the nineteen Leitz MPV photometers that we have, many have stickers with the date, name, and signature of the Leica service engineer who performed the recalibration. In addition, twice yearly we place a precision 1-volt external Reference Voltage between photomultipliers and A/D converters in the data-capture computers to confirm output voltage and local function of hardware. To add a second layer of assurance, all of our labs use two methods to determine Vitrinite reflectance; the conventional manual measurement, to various international Standards, and automated, using Digipet’s Reflectance Profiles. When used together these methods uniquely validate each other’s set of numbers, as shown below. And then, each month, we also run an internal Round Robin between our labs, with the results available below. We go to these extraordinary lengths, and document them here, because we’re passionate about our numbers, but most importantly, we want you, and your customers to know that reflectance data from Pearson’s laboratories, are accurate, regardless of country of measurement. Our clients are provided with statistical data detailing the variation of their products on-line, via secured-access portal, and via e-mail. The objective of automated petrographic analysis of coal blends is to provide timely data on the distribution of component coals in the blend, and provide a tool for process inspection. 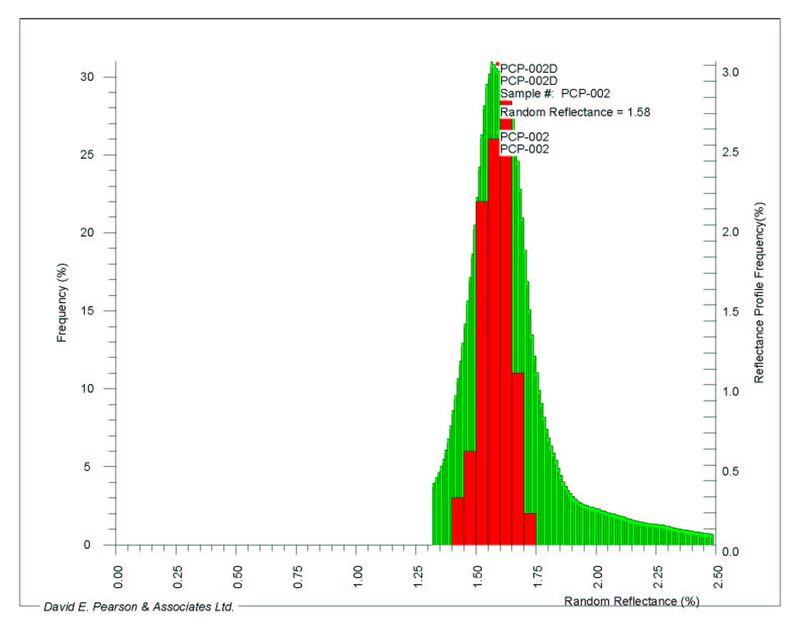 On a daily basis, reports tabulate component-coal percentages, mean reflectance and Total Inerts. Clients receive Microsoft Excel files of such data on a daily basis via automatically triggered e-mail communication. The Reflectance Profile of each blend sample is archived daily, and these can be inspected and compared with others on any time basis (daily, weekly, monthly), for rapid visual comparison of sample variations. Variation of a Coal blend over the course of one week. Run Charts of the percentage of each component coal in the blend are updated daily. They show distribution about the mean value and sigma variation. These are archived on a monthly basis for longer time-frame comparisons. Scattergram plots integrate daily chemical assays of blends with petrographic component composition of the same samples. The dry-volatile content of blend samples is plotted against the proportion of high-volatile (or low-volatile) components in the coal which is determined by automated petrographic analysis. In those instances where a cargo is sampled at frequent intervals, and vitrinite reflectance and maceral component analyses are routinely performed, the on-line Run-charts of all petrographic parameters are automatically updated with the addition of each new sample. The charts show sample variation of means and standard deviations on such vital parameters as mean maximum reflectance (Romax) of Vitrinite, and Total Inerts, over time frames that cover several years. We work for some of the biggest mining companies and steel producers in the world. We may be a small family-based business, but our clients are a who's-who of coal mining and steel production. We are proud to provide our best services for each of our clients.